Hawkish Hillary is a friend of bankers and warmongers, despite her Democratic credentials. Former US Secretary of State, current candidate for the Democratic Presidential nomination. Safe pair of hands for corporate America and its empire. She claims to have one but it is odd indeed: when asked to reveal the content of her well-paid speech to the high and the mighty at Goldman Sachs, she just laughs. Clinton plays both sides of the street, posing as a liberal Democrat while proving her realpolitik credentials by courting the support of conservative imperialists such as the war criminal Henry Kissinger and hardline former Secretary of State Madeleine Albright. One of her main financial backers, Hiam Saban, is a pro-Israel zealot opposed to Obama’s peace deal with Iran – one of the Democrats’ few clear foreign policy successes. The Guardian; The New York Times; Mother Jones; The Nation; Counterpunch; forward.com; salon.com; theintercept.com; thehuffingtonpost.com. Hillary Clinton is a highly criticised and, in some places, deeply loathed figure in US politics. Much of this sentiment comes from Republican partisans, particularly the populist fringe of tea-partiers and evangelical Christians. They see any number of conspiracies in which she is the major schemer: taking away their precious guns, putting Planned Parenthood clinics on every corner, and even creating the Donald Trump campaign to destroy the Republican Party. Mostly they hate her because of her effective stand in support of women’s reproductive rights and equality. Yet there are many good reasons to be suspicious of Clinton and the agenda she would impose as president. Make no mistake, the Clintons (‘Billary’ to some) – who still operate as a team, with former president Bill a key campaign figure – remain deeply committed to maintaining the corporate status quo. Hillary has earned millions in speaker fees ($225,000 a crack in some cases) from Wall Street firms and trade associations eager to hear her views. In the early days of the 2007-08 financial meltdown she opined that it wasn’t all the banks’ fault, ‘not by a long shot’, and instead blamed homebuyers who should have known they were getting in over their heads. These days, she talks a good game against bank malfeasance, but her voting record does not back this up, and a grateful financial sector continues to flood her campaigns with contributions. Those looking for the roots of today’s inequality in the US often trace it back to Bill Clinton’s administration (in which Hillary played an active part), particularly the 1999 repeal of the already enfeebled Glass-Steagall Act that separated commercial and investment banking. ‘Clintonomics’ moved the Democrats away from their traditional populist commitments to fight poverty, instead cutting off public support for the poor after just two years. So the ‘progressivism’ in which the Clintons try to clothe themselves has always been skin deep. 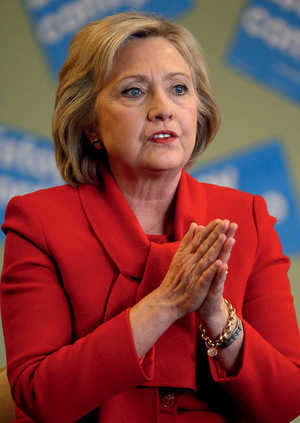 As a New York senator, Hillary voted to authorize George W Bush’s invasion of Iraq. As Secretary of State under President Obama, she situated herself in the hawkish ‘regime change’ wing of US foreign policy. Even in a political culture wildly enthusiastic in its support for Israel, Clinton outdid herself by placing almost complete blame on Hamas for the butchery committed by the Israeli Defense Forces during the 2012 Gaza incursion, and providing a total whitewash for Israel’s murderous assault on an unarmed Turkish peace flotilla trying to break the Gaza blockade in 2010. The fingerprints of Team Clinton were all over the 2009 military coup in Honduras that toppled democratically elected but left-leaning president Manuel Zelaya. At the time, the US was desperate to slow down the Bolivarian revolution that was sweeping Latin America. As Secretary of State, Hillary avoided using the ‘c’ word, however. Were Zelaya’s removal to be considered a ‘coup’, certain measures against the coup-making oligarchs of Honduras would come into legal force. In the US, these coup-makers were effectively represented by legal pitbull Lanny Davis, a Team Clinton member who earned his spurs defending Bill during his impeachment hearings back in the 1990s. In her obligatory campaign autobiography Hard Choices, Clinton presents herself as a woman of steely resolve pushing the Obama administration to a harder line, from Afghanistan to Libya. Sadly for her, this does not feel like the season for a political insider in US politics, with an electorate increasingly suspicious of what politicians are up to. Bernie Sanders, with his overtly socialist message, is mounting a credible challenge in the Democratic primaries – to the surprise of almost everyone.